However, this is too broad. If you're too busy trying to market your school to an audience that may not be interested in going to your school, you're not only wasting resources but also potentially missing out on being able to reach prospective students who are actually interested. You need to make your website an enrollment machine. To pinpoint exactly who your audience is, you'll need to develop a buyer persona. A buyer persona is basically a fictional individual that you create in order to represent your ideal customer (or, in the case of a vocational school, your ideal student). The following are some of the questions you'll want to ask about students who are ideally fitted to enroll in your school. These questions will help you to create your buyer persona. What are their demographics? - How old are they? Are they single or married? Do they have kids? Where do they live? Marketing a vocational school to someone right out of high school is going to be different than marketing to someone who maybe dropped out of college and is thinking about going back. Knowing where they live is helpful to figure out what areas to focus your marketing in as well. What are their pain points? - Figuring out the pain points of your buyer persona will allow you to present your school as a solution more effectively. For example, if a student is looking to attend a vocational school in order to get a better job to help support their family, then you can position yourself to meet that need by highlighting career options or the average salaries that graduates make upon completion of your program. What are their goals? - Knowing their goals, like knowing their pain points, allows you to better position your school to meet their needs. What are their hobbies and interests? - You can highlight certain clubs or extracurricular activities available at or near your school in response to certain interests or hobbies your students tend to have. 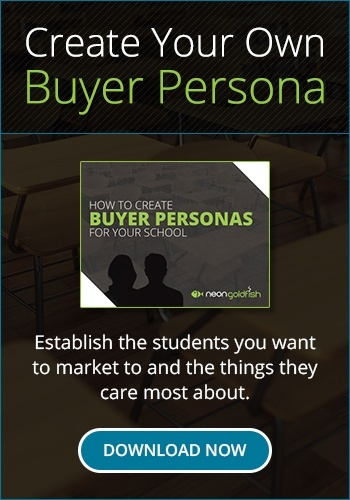 Once you have a buyer persona, it becomes easier to reach the students who are more likely to be interested in your school. You can create content on your website that directly appeals to your buyer persona, thereby making your marketing efforts more effective. Additionally, you can have more than one buyer persona. In fact, as a vocational school, there's a good chance that you'll have a handful of buyer personas. Use the data you have - Look at your student records to determine where the majority of your students are from geographically. Ask specific questions on opt-in forms - If you have an email newsletter that prospective students can sign up to, make sure you ask certain questions on the form that will provide you with some of this information. Do a survey - You can find out a lot about your buyer persona by simply asking current students to fill out a survey. Use social media - Ask prospective and current students on social media about their hobbies, interests, concerns and more. By developing your buyer persona, you'll not only be able to more effectively reach your target audience, you'll have a better understanding of who your students are. For more vocational school marketing advice, visit us at Neon Goldfish to request a consultation today.